Program management can be a difficult task. Most managers have so much to consider in terms of costs, risks, benefits and so on that achieving the best results is virtually impossible without a well-practiced and comprehensive management framework. Managing Successful Programmes (MSP) is a framework designed to do just that - help you manage programs successfully! Originally from the UK, MSP has been applied to projects in a variety of different industries, sectors and locations. In essence, it breaks programs down into manageable projects, each with clearly defined roles, responsibilities and lines of communication. This approach results in programs worth far more than the sum of their projects - but this is far from being the only benefit of studying MSP! 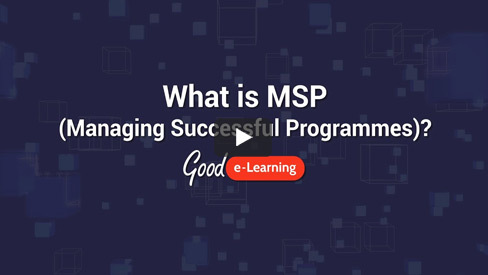 In this video, Mike from Good e-Learning discusses the biggest benefits that MSP has to offer. Whether your company is an international giant or a plucky startup, MSP can offer the tools and guidance to help you enjoy maximum benefits from each of your programs, regardless of their size, scope or even their purpose. For more information, visit our Project Management page, or check out our article on the benefits of MSP. Good e-Learning is a leading online training course provider. Our MSP Foundation and Practitioner courses offer easily accessible and highly engaging training, ensuring that users can enjoy studying MSP even on mobile phones and tablets. Thanks to our in-house team of experts, we are able to offer top-tier training at competitive prices.